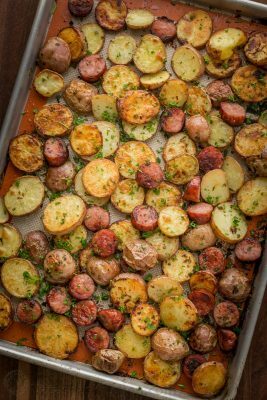 These roasted potatoes are ultra crispy and flavorful with a perfect browning on the coins of kielbasa. Easy one-pan dinner idea. Preheat Oven to 400˚F. Line a large baking sheet with parchment paper, or Silpat. Cut potatoes into rings no larger than 1/2" thick. If potatoes are tiny baby red potatoes, you can half or quarter them so they are no larger than 1/2" thick. Slice Kielbasa into 3/4" thick rings. Place potatoes and kielbasa in a large mixing bowl. Add parsley, 2 pressed garlic cloves, 1 tsp salt, 2 Tbsp olive oil and toss to combine. Spread onto baking sheet and bake at 400˚F for 45-50 min or until potatoes are browned an crisp. Stir halfway through baking to ensure even browning. Garnish with fresh parsley if desired.